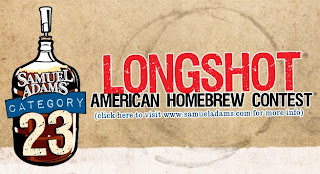 Sam Adam's has put a bit of a twist on their Longshot American Homebrew Contest this year by wanting beers that fit into the BJCP Category 23. Category 23 is the catch-all category, any beers that don't fit the other categories can be entered into this one. Simply put, brew anything you want with whatever you want in it and it can't be judged as "out of style". Although, I guess it could be considered "out of style" if they think it actually fits too closely to one of the other categories. In other words, this is not the time to try and impress them with a perfect Baltic Porter. But ferment it with some wild mushrooms and age it in an old rain barrel and you may have something. Judges will consider the aroma, appearance, flavor and mouthfeel of your beer. The overall uniqueness of the process, ingredients used, and creativity will also be considered. The overall rating of the beer depends heavily on the inherently subjective assessment of distinctiveness drinkability and creativity. Should be interesting to see what they end up with. Will they choose something way out there in the spirit of this year's contest? It does still have to be drinkable by a pretty wide audience, they do have to sell this stuff.